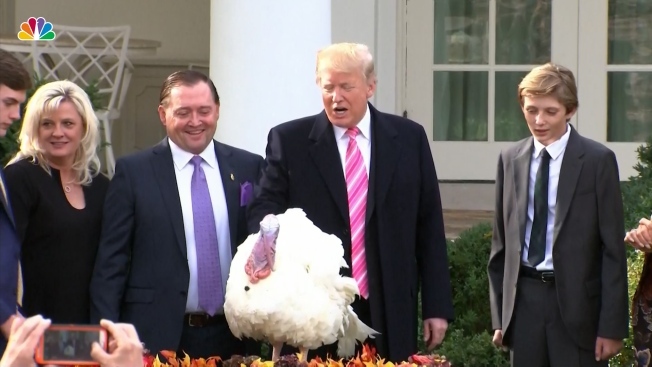 Continuing a time-honored White House tradition, President Donald Trump pardoned the national Thanksgiving turkey in a Rose Garden ceremony Tuesday, his first. A turkey named "Drumstick" won the title of America's National Thanksgiving Turkey Tuesday morning, the White House announced. But dont worry! His alternate, "Wishbone," was also spared. The two turkeys will live out their lives at Virginia Tech University at a place called Gobbler's Rest, where their predecessors Tater and Tot live. Trump joked about his history of reversing former President Barack Obama's executive actions, saying, "I have been informed by the White House counsel's office that Tater and Tot's pardons cannot under any circumstances be revoked," adding that they "can rest easy." The White House said the first family will donate two packaged turkeys to the charity Martha's Table in Washington. Trump is set to spend the Thanksgiving holiday at his Mar-a-Lago club in Palm Beach, Florida. White House archives show that Americans have sent presidents holiday turkeys at least since 1873 under President Ulysses S. Grant. But the National Thanksgiving Turkey dates from 1947, when the National Turkey Federation became the official supplier and presented a 47-pound gobbler to President Harry Truman. In those days the turkeys were destined for dinner. The perk of taking presidential turkeys to Washington goes to the chairman of the National Turkey Federation. This year that's Carl Wittenburg, from the Minnesota town of Alexandria. Wittenburg recruited five Douglas County 4-H members to help. They're the same teens he and his wife, Sharlene, mentored to a second-place finish in the statewide 4-H Science of Agriculture Challenge this summer with a project on turkey bedding. None of the girls had worked with turkeys before. Now they're all going to the White House to help oversee the bird, though Wittenburg's 19-year-old son, Wyatt, will lift it up onto the table. The Wittenburgs grow more than 100,000 turkeys annually for Northern Pride Cooperative in Wyndmere, North Dakota, but they raised the presidential flock on their smaller hobby farm near Alexandria. The birds hatched in late June. The star and an understudy who would step in if there's a last-minute problem will be around 47 and 37 pounds respectively by pardoning time. The goal is getting the turkeys used to people. Teaching them to stay on the table and behave is the key, said Katie Kent, 18. The birds are hand-fed grub worms as bribes. "We're getting them used to being on that table and getting them to gobble and strut on command," said Kodi Bundermann, 17. Strutting for a turkey means fanning out his tail feathers and puffing out his body feathers. Toms do it to look good to the hens, Wittenburg said. Gobbling also is a male behavior; females click or cluck. It's hard to get turkeys to strut on command, he said, but they'll gobble nine times out of 10. The 4-Hers also play them music. They seem to like country, said Christina Kuismi, 16. "They love anything shiny, or even the ends of shoelaces, which are a little shiny," Kuismi said. "They like to untie shoelaces. They've gotten really good at it." Another challenge for the ceremony is that turkeys are very easily distracted, she said. "They're just very easily entertained," she said. "They just want to go everywhere and see everything and explore." The team selected the two best birds from a flock of about 20, They looked for showmanship and character with an absence of any stage fright, Wittenburg said. They wanted turkeys that would strut and gobble for the cameras and the president yet remain calm on the table, he said. The birds got officially named Drumstick and Wishbone on Monday, and the White House opened a Twitter poll on which one Trump should pardon. They stayed at a hotel near the White House for the run-up to the big show. A flock-mate was pardoned by Minnesota Gov. Mark Dayton on Friday. The presidential birds will finish out their lives in leisure at Virginia Tech, joining the 2016 winners, Tater and Tot, at Gobbler's Rest in Blacksburg. With luck, they might live another year or more. A few of their predecessors have hit the ripe old age of 2. Very few domestic turkeys live that long. The vast majority get sent to processing plants when they're between 14 to 20 weeks old. Pardons have not always gone smoothly and gratitude is not guaranteed. In 2001, a turkey named Liberty pecked President George W. Bush in the midsection - some reports say his crotch - drawing laughs from the crowd and an awkward expression from the president's face. Another memorable photo shows a grimacing President Ronald Reagan getting a face full of feathers when the 1984 turkey started flapping its wings. A turkey also flapped around on Reagan before jumping off the table and strutting around the White House lawn in 1981. Minnesota is the top turkey-producing state, with 450 farmers raising about 46 million turkeys this year. North Carolina is No. 2. They're among six states that account for nearly two-thirds of U.S. turkey production. The others are Arkansas, Indiana, Missouri and Virginia. The U.S. Department of Agriculture projects that farmers will raise nearly 245 million turkeys this year. The National Turkey Federation estimates that Americans will eat about 46 million for Thanksgiving, 22 million at Christmas and 19 million for Easter. But most turkeys are destined to become deli meat, sausage and other products.